Shoshana Krieger is a former Assistant Director of Admission at the University of Chicago; she also served as an Admissions Counselor at Trinity University in Texas. Ms. Krieger is a graduate of the University of Chicago, from which she earned a BA in Interdisciplinary Studies in the Humanities. While working in the Admissions Office at the University of Chicago, Ms. Krieger was also the Athletics Department Liaison, where she worked closely with varsity coaches and athletic recruits. Additionally, she oversaw the Admissions Office’s relations with high school counselors. 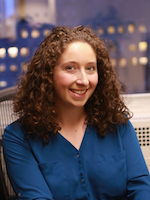 Ms. Krieger brings her varied admissions experience, as well as her experience in NYU’s Office of Financial Aid, to her work at Expert Admissions.